Engage, Understand and Enhance your Learning Experience. This tends to be a term that’s bandied about when discussing better learning, but its hard to find someone who doesn’t argue with the premise that individuals learn in different ways. Some of us learn better by visualising things, whereas others can benefit from reading in a structured, ordered text. We know this from personal experience. The recent accessibility of audio books provides another learning medium. What online study can provide is the ability for the student to learn in the manner that best suits their needs. We are pretty sure that there are not many teachers or students who don’t supplement their learning with resources from the internet. Easy access to additional content is one of the great advances in learning over the last few decades. Students with curiosity can source and share a life’s worth of content in a couple of clicks. Plus, content is being presented in more interesting formats that make personalised learning a reality. You can now not only create and access great content but by using the correct tools you can aggregate all your study content into the one place. This means that you are organised and allows you to be more focused and efficient. Solutions using cloud based technology allow users to access their information where ever they have an internet connection, even on the go. For more reasons to study online and to learn about studies that have proved the effectiveness of online study, read our blog on 4 reasons why you should be studying online. Examtime’s unique focus on using innovative solutions to foster exam success means that the benefits of online study can now be a reality. 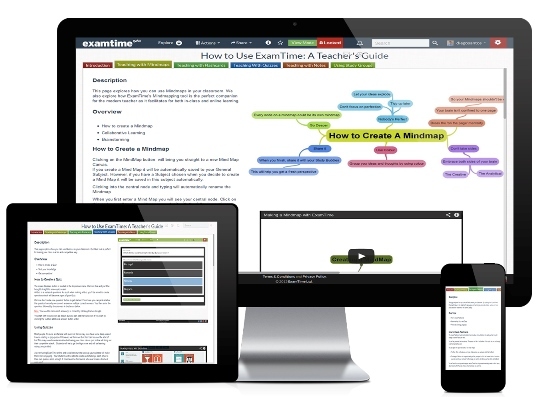 By using Examtimes tools, students can organise, personalise, learn, revise and test themselves. All in a format that suits their learning style, and even on the go. But don’t just take our word, start using Examtime today and take the first step to Exam success.